Structure My Deal tools are complete — you're ready to visit Kenny Kent Toyota! Touted as the most fuel-efficient Tacoma to ever land on the market, the all-new 2016 model is the best one yet. It's offered in five trims - SR, SR5, TRD Sport, TRD Off Road and Limited - as well as two cab configurations: Access Cab and Double Cab. Built using high-strength steel, the 2016 Toyota Tacoma features a new aggressive front end, a fresh locking tailgate and muscular-looking wheel flares that complement its new look. To discover additional details about the new midsize pickup and its multitude of benefits, read our 2016 Toyota Tacoma review below. 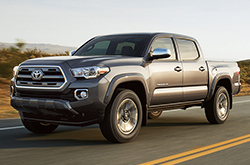 Designed to handle both on- and off-road terrain with ease, the 2016 Toyota Tacoma is available with two new engine options that support its offerings. The first, a 2.7L four-cylinder, is offered solely on SR and SR5 models, generating 159 horsepower and 180 lb.-ft. of torque. The larger 3.5L V6 option is outfitted on the rest of the lineup, and has the ability to pump out 278 horsepower and 265 lb.-ft. of torque. 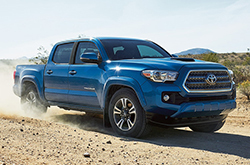 Both four-wheel drive and rear-wheel drive configurations of the Tacoma are available, and depending on which one you choose, you can either take advantage of a manual or automatic transmission. With the V6 model, you can also tack on the Tow Package, which features extra off-road technology and offers a 6,800-pound towing capacity. Further supporting the Tacoma's hauling capabilities is the inclusion of a deck-rail utility system, four tie-down cleats and two-tier loading, which are featured with both available bed styles. Additional components offered on the 2016 Toyota Tacoma in Evansville include a power sunroof, dual-zone automatic climate control, Qi wireless charging, smart key, push-button start and 2.5 versions of the Entune multimedia systems. Each of these features and others help deliver a first-class in-car experience for drivers and passengers. If you'd like to find out further info about the new Tacoma and its equipment, scroll down and keep browsing our 2016 Toyota Tacoma review. We're positive that the Tacoma is perfectly designed for you. That's why we have the courage to ask you to compare Toyota's latest model side-by-side with the 2016 Nissan Frontier, Chevrolet Colorado, GMC Canyon and the Honda Ridgeline. 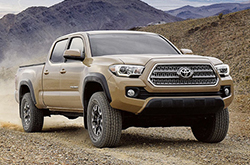 The Tacoma's superb looks, convenient onboard technologies and budget-friendly MSRP are sure to win over IN shoppers. When compared to the vehicle options listed above, in terms of price it's clearly a truly outstanding value, making it a well-liked choice among Toyota customers in Evansville. Find out more info in our bullet list below this paragraph! If you have any questions about the 2016 Toyota Tacoma after reading our review, please contact Kenny Kent Toyota online or by phone. As the respected Toyota retailer in Evansville it is our duty to present our customers with reviews created by the finest Toyota writers around. Each summary is loaded with valuable material, including info about mpg and more - everything you need to make an intelligent purchasing decision. Now that you've read Kenny Kent Toyota's review of the 2016 Tacoma, please fill out the form on the right to message us to find out about OEM incentives and finance offers, so you can save big on your next purchase!